Famous composers? Why, I have a whole Liszt of them! Wah, wah. I was thinking of this "hilarious" old joke recently when facing the daunting task of keeping this blog updated on my self-imposed goal of "every day." But, as every blogger knows, keeping your site updated and readable takes time - between eight to 12 hours a week to do it properly, by my estimation. So, it's not surprising that every blogger has, at some point, thrown his or her arms up in frustration, curled into the fetal position, and shouted, "The hell with all of this blog writing - from now on, I'll just make lists!" I admit to having this thought frequently. A list is just so much easier, and maybe makes more sense, given that my daily unique visitors keep growing, but the length of time they spend here keeps getting shorter - down from 2:33 minutes last week to 2:09 this week, according to Site Meter. Is it wicked to love lists? Not only that, I actually like lists. I love nothing more than to add things I've already done into a to-do list, so I can cross them off instantly and feel smug and self-satisfied with everything that I've accomplished. I also admit that I live for year-end top 10 lists, and make many of them myself. For some reason, the year just doesn't seem to make sense without them. When we make lists, we also assume that we're doing "our readers" a service by wading through reams and reams of information - movies, albums, singers, whatever - so that they can cut to the chase and start loving what we love, right here right now. It's kind of the digital equivalent of "Olivia's picks" at Music Trader, though it may be a bad example, because I actually like her picks, unlike "Drew's picks" at Movie Village. Just kidding "Drew," whomever you are. But, here's the problem: if anyone can have a blog, and anyone can make a list, has list-making become obsolete? 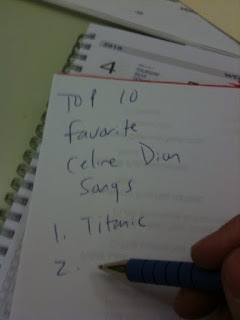 I mean, who care's what your favorite music of last year might be, when I just gave you my list of favorite music? It's impossible to make a list of 10 best anythings without getting political. On my list of Top 10 Albums of All Time, for instance, the Clash's London Calling would be right near the top, though I might actually play Men Without Hats Rhythm of Youth more. When this happens, am I just making a list that I think positions me as a "happenin' dude" or am I listing what I think is actually good? The best lists show a tolerance for art and box office and contain at least one surprise. So, yeah, rank "Zooey & Adam" as one of your Top 10 films of last year, but include "Avatar," just to show that you're not an elitist snob. Conversely, love the Hollywood movies, but include at least one foreign film to show that you're not beholden to Michael Bay. One on hand, no one wants to read a list in which nothing's new, but on the other: is there anything more depressing than finding out this year's Oscar nominations and realizing that you've seen none of them? I've noticed that list-making is being taken to extremes lately, not only online but in magazines, where "service journalism," like 10 WAYS TO DRIVE YOUR LOVER CRAZY IN BED! tends to thrive. The trouble with listing everything is, of course, that lists stop mattering, and you might as well list nothing. For instance, the New York Times publishes seven, separate best-seller lists for books a week. Entertainment Weekly's yearly Best Of issue is cover-to-cover lists, featuring everything from entertainers, DVDs, TV shows, trends, and breakout stars; even more counter-productive is that they have a list and then a "second-opinion." So, Lisa Schwarzbaum's list of best films is "the list" and Owen Glieberman's list is "the second opinion" for no other reason than, presumably, one has seniority and/or gets paid more than the other. Last year, Schwarzbaum and Glieberman only agreed on three of the year's best films. By proving that two people who love and review films for a living can't agree on what's "best," isn't Entertainment Weekly undermining their authority by splitting their votes and allowing them to contradict one another? Given that, maybe the perfect lists have some authority - you know the critic or the person and respect their finality of judgment - and something worth arguing. Back to the Clash example: a good friend of mine constantly argues that London Calling isn't punk, it's pop. Good! It's now number one on my list of Top 10 Punk Albums of All Time. Please submit all other complaints in writing, and I will compile them into my Top 10 List of People Who Hate My Blog, 2010. Should be a barn-burner. Haha! Super fun read. My eyes were peeled open the whole time...and I think the coffee has worn off now, so kudos. What's in your junk drawer? Live from the IPPs: last day!